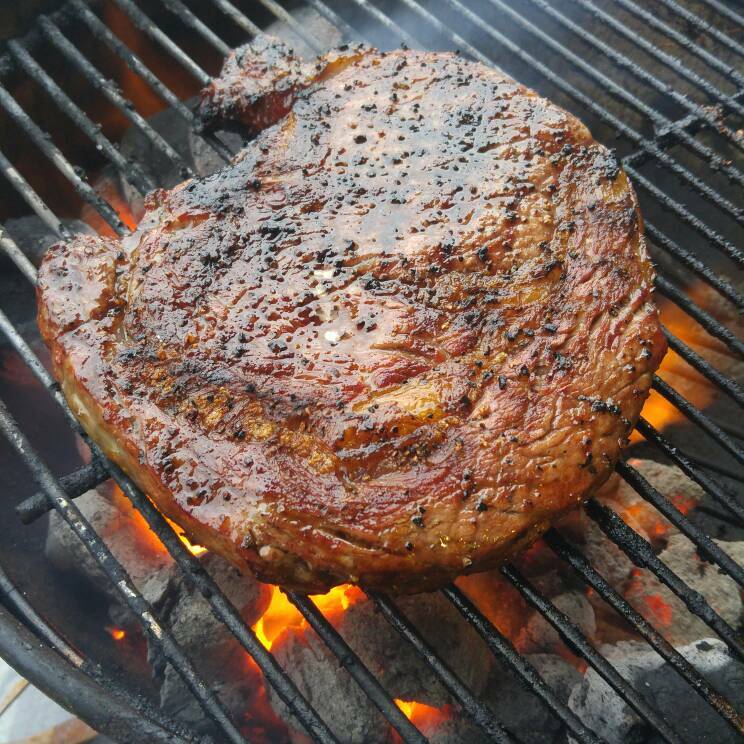 Here are my unscientific findings on a reverse sear ribeye test. 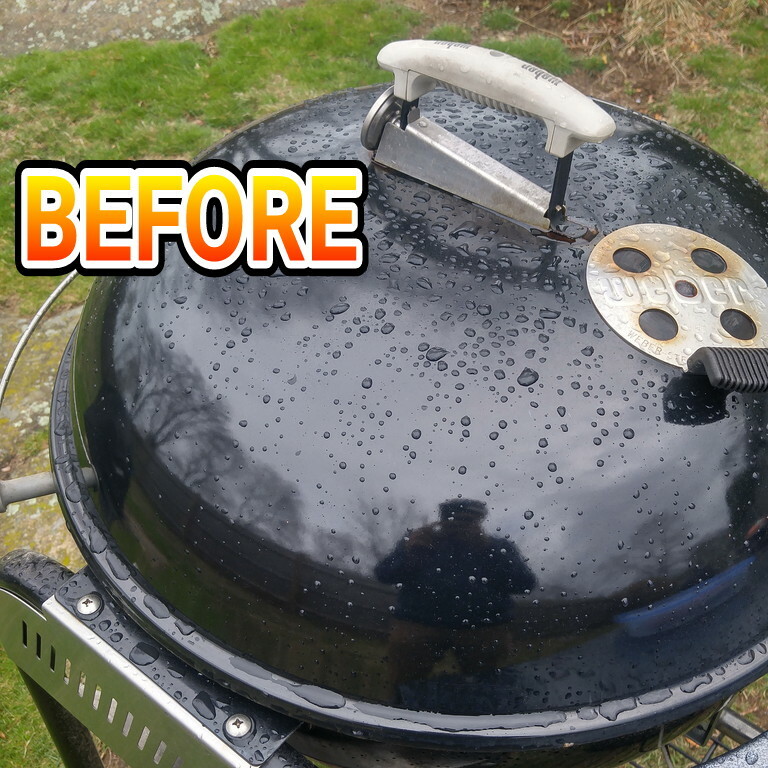 The reason for the test is because I modified on of my Charcoal Weber Go-Anywhere grills with top lid vent knobs. The knobs are rated up to 400 degrees. Not having any idea how hot the lid would get I tested on a WGA that did no have the knobs installed, in case the lid got so hot it would ruin perfectly good knobs. 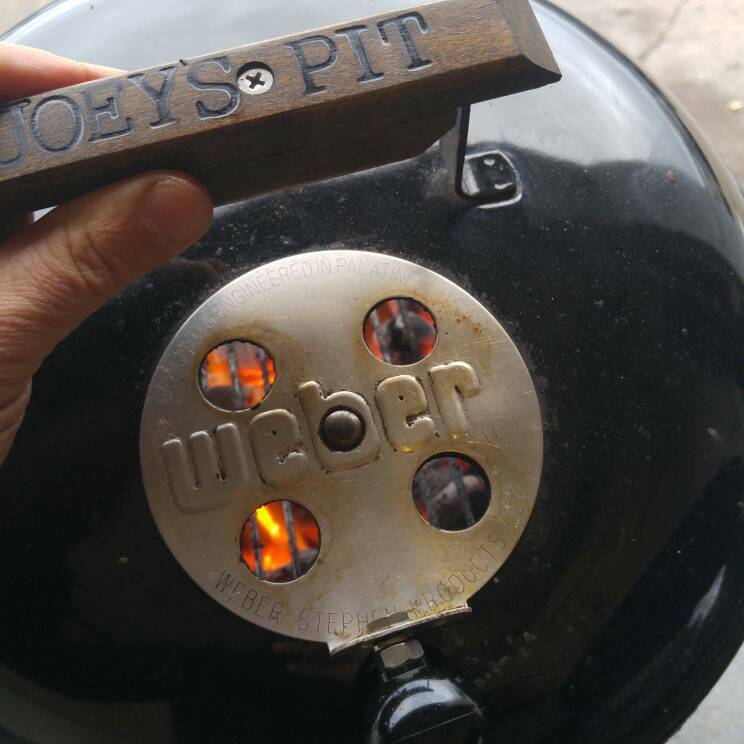 I left both bottom vents wide open, the top vent over the coals closed and the top vent on the opposite side wide open. About a quarter of a chimney of coals and 12 coals on the charcoal grate will be the amount of coals we are using. 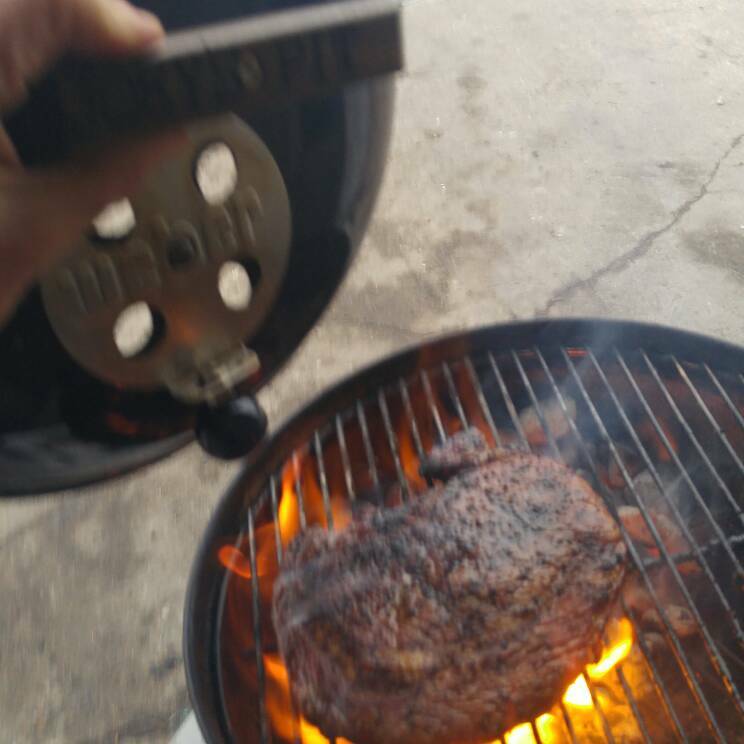 Here’s the WGA set up for the reverse sear. Fifteen minutes with lid closed 469 degrees F lid temp. 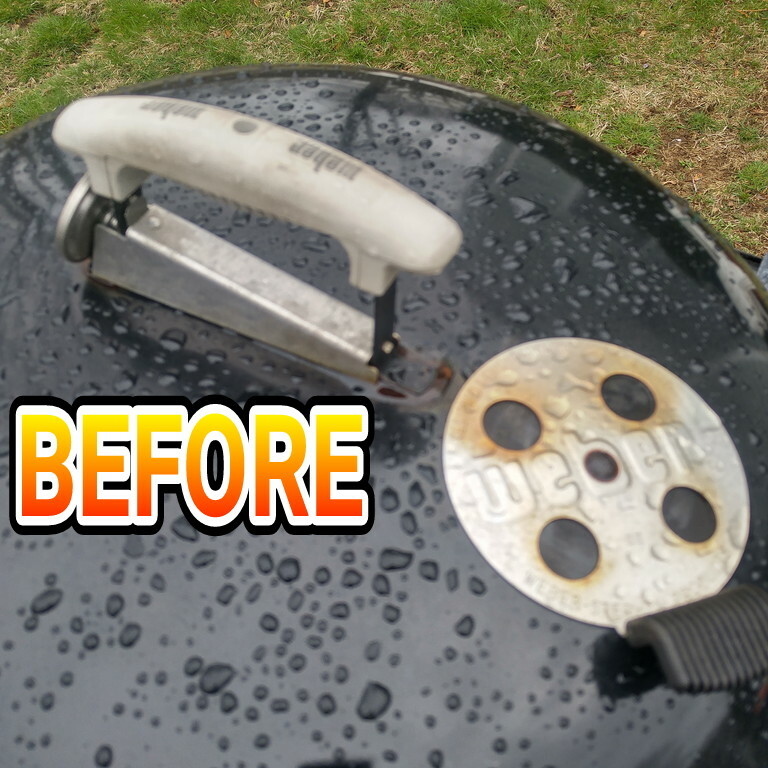 $451 degrees grill grate temp. 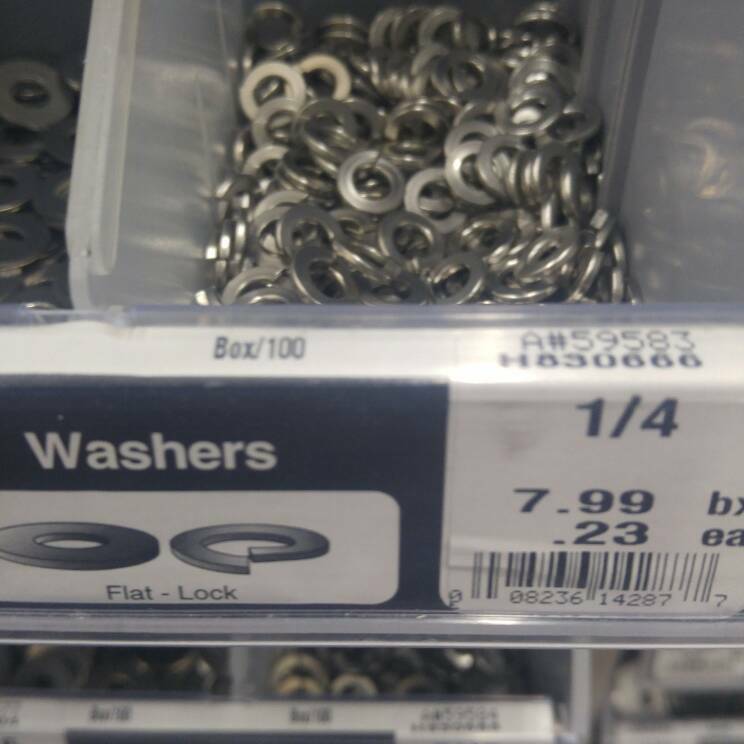 I think that if I use a washer between the knob which has a metal threaded insert and the vent tab that it will work out fine. I plan to test tomorrow with the modded unit. Strength, durability, and heat resistance are some of the benefits of this broad range of phenolic handle. Extremely versatile range of mountings. Female insert machined to suit. Mounting type: female insert. Thread length/depth: 3/8″. Mounting diameter and threads per inch: 1/4-20. Plastic material: thermoset; insert material: brass. Measures 7/8″ diameter by 2-41/64″ height. 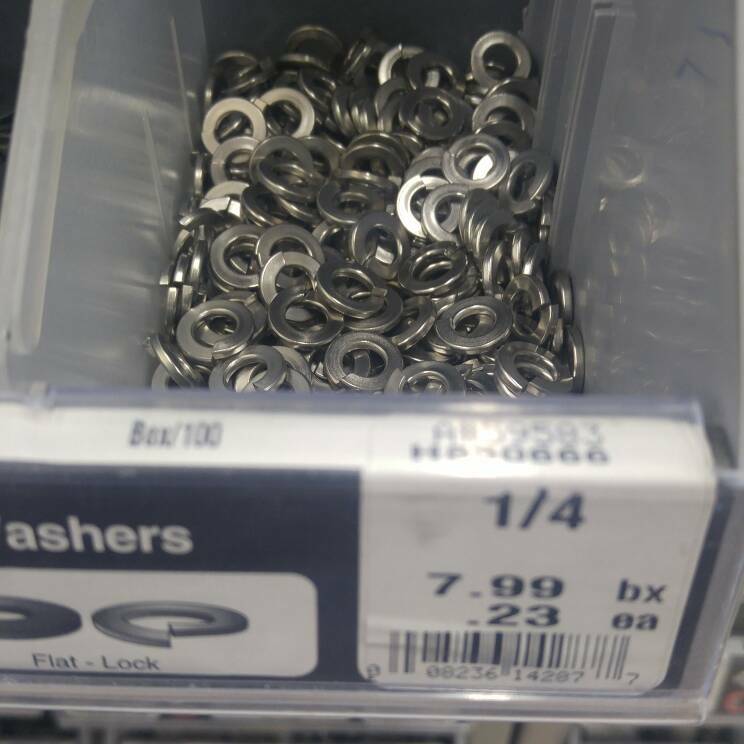 At Hometown Ace Bought M10 Stainless Bolt and Lock Washer. Started pilot hole by lining up the bolt on the vent and marking the middle with a much smaller drill bit. Once the smaller bit was through went through with a 3/8ths which was a perfect fit. then just put everything through as shown and tightened. 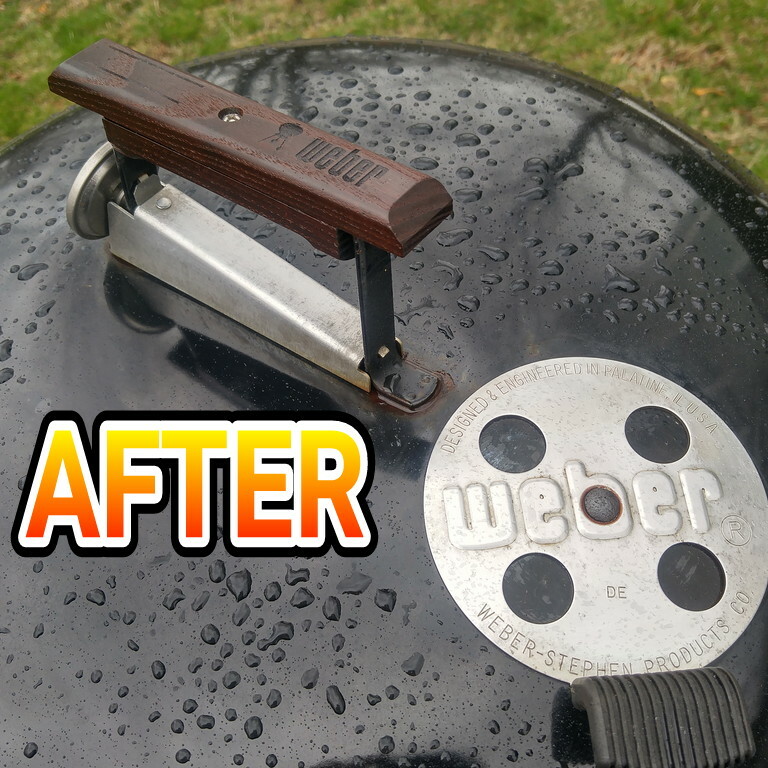 This mod can be done on any bare Weber vent. I got an old 18 inch ash catcher ring that I guess had been hanging in the back warehouse at Fosters Grill Store for a decade or so. 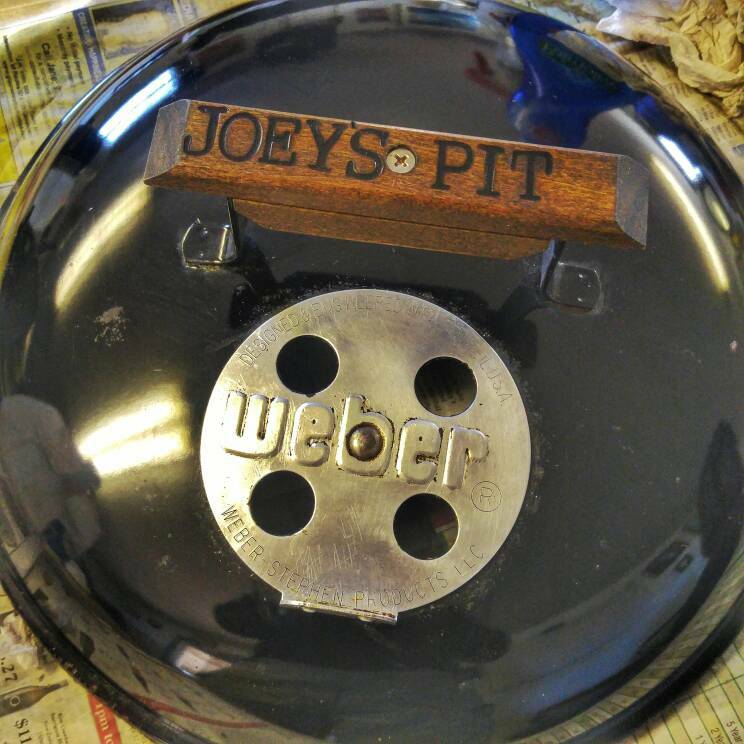 Weber stopped selling 18 inch kettles with the pot style enclosed ash catchers a long while ago and now ships them with the dish style ash catchers. Next I pilfered the ash catcher pot off the beat up green One touch Premium that I found on a walk with the lovely Katelyn which will fit the ash catcher that I bought in the warehouse at Fosters. Put them together and snapped it into place on the Sam Adams One-Touch Silver to turn it into a One-Touch Gold. Here she is when I got started cleaning her up. structurally perfect but covered in dust and a dirty bowl with some caked on charcoal remnants. She also came with a highly sought after laser cut Sam Adams logo grill grate which I stored away to keep pristine. it had never been cooked on. So I soaked the ash catcher pot and went to work on the bowl and lid which both came out spotless. 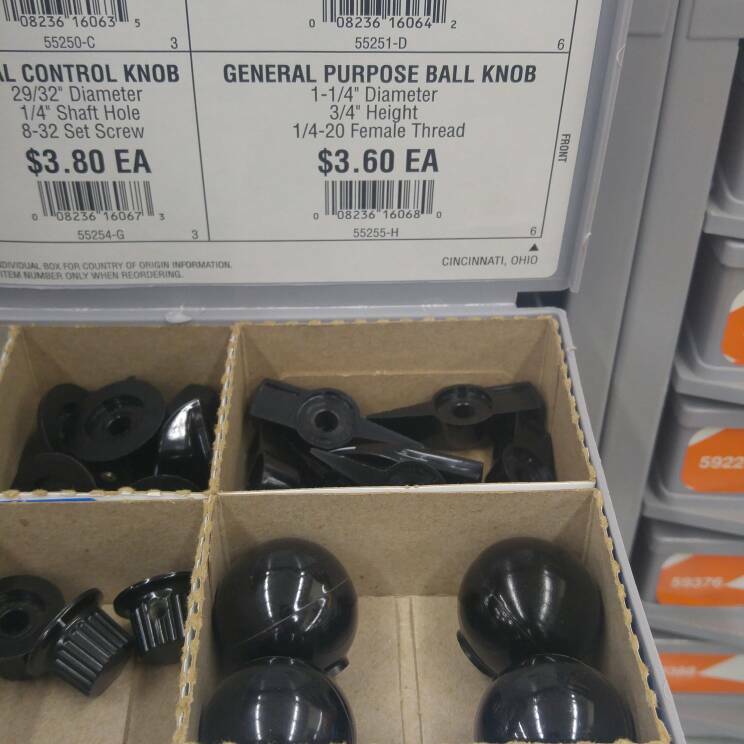 One of each of the following that can be found at any self respecting Hardware Store. This one was Ace Hardware at Gloucester Crossing. 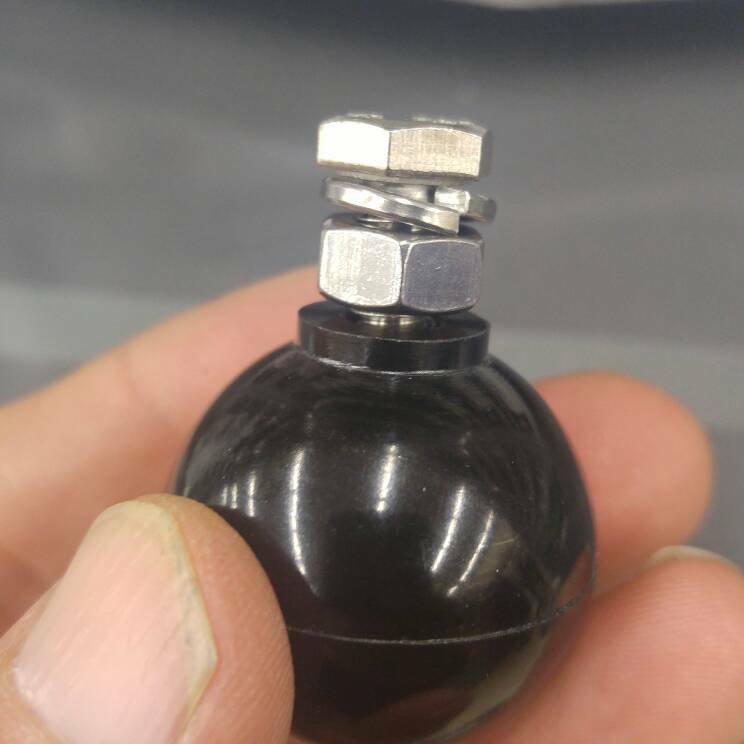 1-1/4 Diameter 1/4-20 Female thread general purpose ball knob. 1/4 inch drill bit. Go slow. 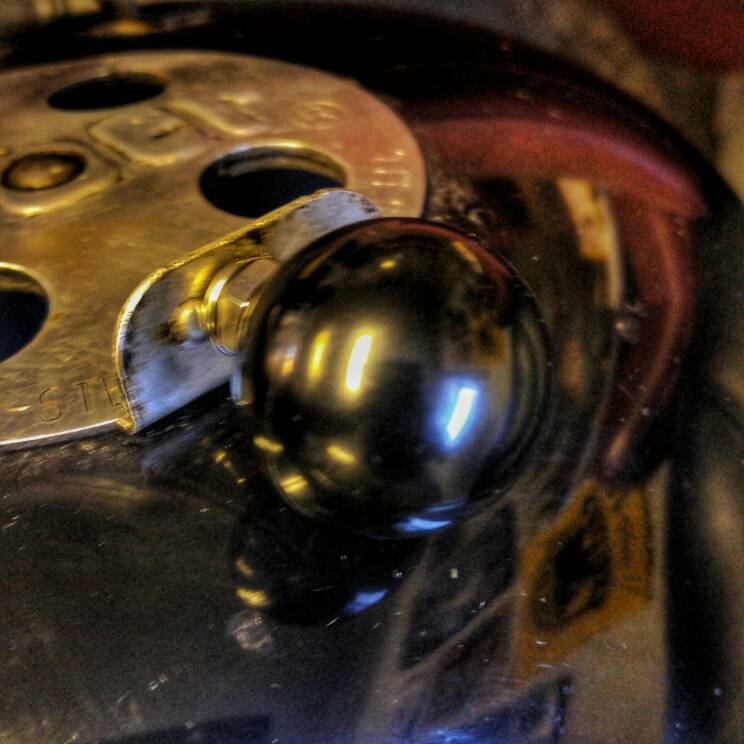 Once drilled feed the bolt through the drilled lid vent tab, then slide the lock washer and next the nut. Tighten and then screw the ball knob on. Done. The ash catcher assembly had a bit of a droop in the back so one of my fishermen had some shark fishing stainless steel 175lb leader wire so we snugged it up tight. I may invest in a dremel tool with a buffer attachment and hit the ash catcher with some polish. Anyone have a recommendation for a certain type brand? Sears had some sets for sale. What a nice surprise when I got to the dock this morning. 4:30AM and Joey Ciolino dropped off the frame, put together. 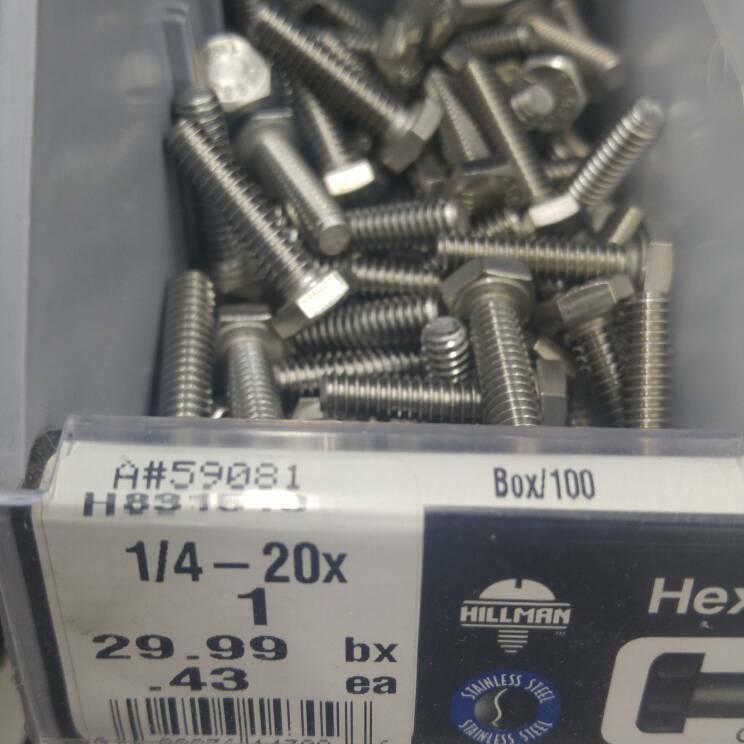 He used brackets and I think these are called sheet metal screws to firm it up and then he spray painted over them with black. I had to really look to even notice because it blended in. To A Weber Grillfella it would be obvious if you were focusing your attention at the base of the grill but I don’t think 99% of the population would think it was anything but standard. Its really solid with the threaded rod and the brackets. Next to get cleaning, a combination of scotchbrite pads, steel wool, water, dishwashing detergent and elbow grease. Lots of surface dirt and stains. Most came out. I think I’ll pick up a bristled brush to scrub the grey plastic handles. The little grooves are tough to get into to clean. Last night it was brussel sprouts, mushroom and onion skewers and ribeyes on the 2009 Weber Performer Deluxe. 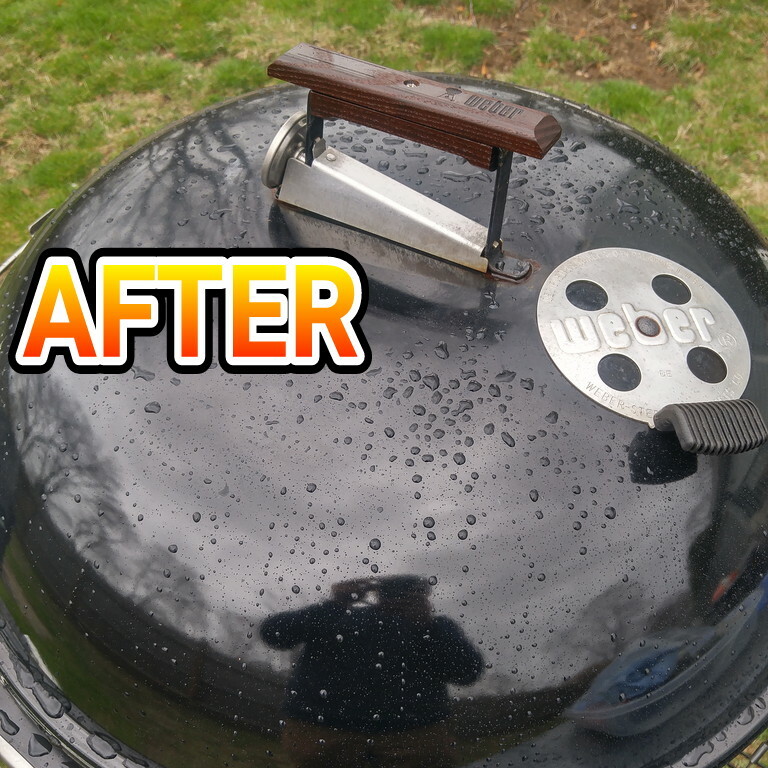 Decided to swap out the standard Weber grates for the cast iron ones on the STOK. Worked out well using the STOK veggie basket insert to grill the brussell sprouts which were lightly coated in evoo , Atlantic Saltworks Salt and crushed black pepper.